Financial organisations and their customers are being urged to fully embrace the digitisation of cheques, as the payment tool undergoes the most significant revamp in its 358-year history. That is the key message from Martin Ruda, Group Managing Director of The TALL Group of Companies, as the first phase of the highly anticipated Image Clearing System (ICS) comes into effect. 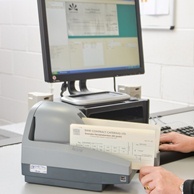 From Monday 30th October, the cheque clearing infrastructure is now in place to accept data and scanned images, in lieu of the actual paper cheque, and by the end of 2018 it is expected that all banks will be required to clear cheques on the image and data files alone. As a result, cheques will be ‘truncated’ (digitised) at the point of deposit, and will no longer be transported during the clearing process. The paper document will have no legal value once imaged and that image transmitted into the infrastructure, so the integrity of the digital image becomes fundamental to its use as the ‘instrument’ to achieve the funds transfer. Industry commentators have overwhelmingly agreed that the introduction of the cheque Image Clearing System (ICS) will drastically enhance the efficiency of the cheque as a payment tool. By agreement with their bank or building society, account holders will now be able to submit images of the cheque they intend to deposit via a desktop cheque scanner or a smartphone app. Following the full implementation of ICS, all items deposited on a weekday will be cleared by 11.59pm the following weekday. Earlier this month, delegates at The Third Annual Conference on Cheque Imaging and Remote Deposit Capture, hosted by The TALL Group of Companies and Digital Check Corporation, were told that banks and building should correspond frequently and efficiently with their customers regarding the changes, if they are to reap the full benefits of the new framework. However, Martin Ruda believes that whilst many consumers are still unaware of the introduction of ICS, the new system will be successful in the long-term. He said: “The digitisation of cheques has proven to be very effective across numerous countries for many years, and the long-awaited introduction of ICS is a significant event as the UK follows suit. With an emphasis on speed and convenience, we encourage banks and building societies to fully embrace the modernisation of the cheque clearing process, which will lead to increased efficiencies for the financial organisations as well as their valued customers. “As the introduction of ICS has been on the UK’s agenda for a lengthy period of time, this has given the wider industry the opportunity to innovate and develop new services that can be utilised by banks and building societies to assist with the implementation of the new system. This includes scanner fulfilment management services – which covers logistics, customer service, software integration and exception management – as well as highly sophisticated solutions designed to protect financial organisations and their customers from any attempted fraudulent activity surrounding the implementation and bedding in of the new clearing system,” he added. Banks will be expected to communicate regularly and effectively with their customers if they are to fully benefit from the introduction of the Image Clearing System (ICS) later this month, which will modernise how cheques are processed. That was one of the key takeaways from The Third Annual Conference on Cheque Imaging and Remote Deposit Capture, hosted by The TALL Group of Companies and Digital Check Corporation. More than 40 delegates from the UK’s leading banks and other organisations attended the event, held at Stationers’ Hall in the City of London, to learn more about the introduction and future impact of ICS ahead of its initial rollout on 30th October. A clear consensus emerged from the conference regarding the need for the industry to better communicate their plans ahead of the introduction of ICS, which will then provide consumers with the sufficient knowledge and confidence to take advantage of the new system. When ICS comes into force at the end of this month, the cheque clearing infrastructure will be committed to accepting data and scanned images, in lieu of the actual paper cheque, and by next summer it is anticipated that all banks will be required to clear cheques on the image and data files alone. This will mean that cheques will be ‘truncated’ (digitised) at the point of deposit, with no further transportation of the document to achieve the clearing process. It is widely acknowledged that ICS will improve the efficiency of the cheque as a payment method, allowing individuals or businesses – by agreement with their bank or building society – to submit images of their received cheques via smartphone or desktop cheque scanner. As a result, all cheques deposited on a weekday will now be cleared by 11.59pm the following weekday, once the ICS is fully implemented. Stuart Cole, Director of Business Analysis at Cheque & Credit Clearing Company (C&CCC), was the first person to take to the stage, providing a valuable insight into the development and implementation of the Image Clearing System. Addressing delegates, Martin Ruda, Group Managing Director of The TALL Group of Companies, said there is a “growing expertise across the wider industry that is at the banks disposal.” This includes a range of scanner fulfilment management services, which covers logistics, customer service, software integration and exception management – providing banks with commercially flexible and scalable solutions. 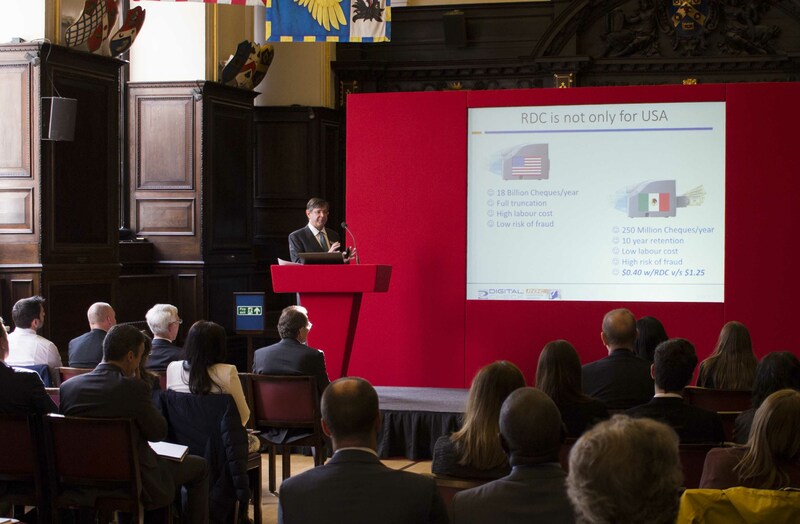 Rob Palmer, Director and Team Leader from the Bank of Montreal, reinforced this point, as he discussed the implementation of Remote Deposit Capture (RDC) in Canada, launched in 2014. He explained that there was not a single bank in North America that does not outsource scanner fulfilment to an expert third-party supplier. During the event, delegates also received information and advice from both UK and US-based presenters ahead of ICS going live. Alex Trombetta and Jeff Hempker, both from Digital Check Corporation, jetted across the Atlantic to discuss the business case for RDC and current trends in cheque scanning around the world. Barry Plumley from Finastra provided the audience with a glimpse into what is now available from a software perspective, whilst Scott Middleton, from DIA Europe, discussed Kappa fraud detection in an image-based world. Peter Thomas, Managing Director of DLRT, rounded off proceedings by exploring the growing range of innovative Image Survivable Features (ISF) that have been developed to further protect cheques from fraudulent activity in the future.